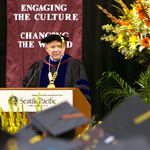 On June 9, 2012, SPU President Philip Eaton delivered the Commencement address at Seattle Pacific University’s 2012 Commencement exercises. His Commencement address is being published here in three parts. You can also read part 1 of this address. Steve Jobs, the founder and driving energy behind Apple, did just this very thing [develop his own language of identity] for the graduates at Stanford a few years ago. Your time is limited, [he said], so don’t waste it living someone else’s life. Don’t be trapped by dogma – which is living with the results of other people’s thinking. Don’t let the noise of others’ opinions drown out your own inner voice. And, most important, have the courage to follow your heart and intuition. They somehow already know what you truly want to become. Everything else is secondary. How does that sound to you? Some of it good, I know. But isn’t this the culture’s familiar language of identity, and so much of it is so breathtakingly self-focused? Steve Jobs wants us to know, “It’s all about me. It’s all about my inner voice. The source of my identity is my heart alone.” We all admire what Steve Jobs accomplished, to be sure, but really, is he right that “everything else is secondary” to my “inner voice”? We’ve got to do better than that, don’t we? But where do we turn for a better, deeper language of identity? Maybe our passage from Luke 5, read so beautifully by Pastor Dahlstrom, can help get us started on the three short paragraphs we might write about who we are. You will recall from our passage in Luke that Jesus approaches some fishermen washing their nets. They had been out all night fishing and had nothing to show for their work. We can imagine their frustration and weariness. Not a way to spend the night, they were thinking. Not a way to spend one’s life. And Jesus steps into this scene and begins to talk to them about a radically different way of fishing. He says: “Follow me and put out into the deep.” And so these experienced, skeptical fishermen put out into the deep, and their boats nearly tipped over with an abundant catch. And they were amazed, Luke tells us. Maybe this is the way to frame our three short paragraphs on identity. When we think it is all about me, we are fishing in the shallows. When we fish in the shallows, we politicize our organizations, we play power games, we indulge in ego trips, we use the tools of manipulation, using others for our own gain. We get to thinking the pursuit of status and prestige and power are the core of our identity. And so that’s a starting point: Stop fishing in the shallows. Put out into the deep. But what then might our lives look like, fishing in the deep? The first thing I might say, the first of my three short paragraphs, might go something like this: Remember that the world is exquisitely beautiful and profoundly interesting. And so cultivate curiosity, always. Be selective, but read all the good books you can get your hands on. Keep up with things. Experience art and music. Engage this culture, enjoy its energy, challenge its presuppositions. This is living in the deep. The great Jesuit poet Gerard Manley Hopkins says: “The world is charged with the grandeur of God.” That’s a radical statement in our culture. He also says: “There lives the dearest freshness deep down things.” And so I say to you: Continue to tap into that deep freshness that is our world.